Autumn is such a magical season and it carries more gold in its pocket than all the other seasons. 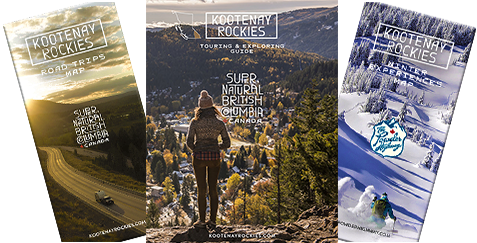 The Kootenay Rockies region is famous for its beautiful falls. Discover the one of a kind colourful scenes. Temperature plays a factor in the coloration of trees; generally October shows the most splendour. Each community below features a popular area that showcases fall colours. You'll discover many more! The city of Fernie boasts many areas to venture out to, to view the beautiful colours of fall. They highlight the Fernie Golf & Country Club and views from their restaurant & patio. Other options include exploring at Island Lake and Hartley Lake. And, nearby River Road and Cokato Road. The leafy deciduous trees first turn yellow, orange & red, and the Western Larch needles turn golden. Best time of year to view is mid-September to mid-October. Between the communities of Kimberley and Marysville, you'll see the brilliant golden mantle of the Western Larch. The Larch tree is the only conifer that loses its needles in the autumn. The larch needles fall before the snow flies. New needles are soft green, turning golden yellow in the fall. The Kimberley Nature Park Society offers two hikes in October to view the wonderful array of fall colours: the Golden Larch Hike and Chasing the Colours. During September and October, Golden is alive with vibrant fall colours. Take a stroll downtown and along Highway 95 - the pathway is tree-lined with gorgeous maples and a mix of other deciduous trees. They provide a spectacular spectrum of purples, reds, oranges and bright yellow tones. These, combined with the majestic mountains that surround Golden are a true delight and fantastic backdrop to the mountain town. Towards the end of October, the red berries on the Mountain Ash trees are truly stunning against the snowcapped peaks. The city of Nelson has a beautiful setting on a hill side overlooking Kootenay Lake. It has dramatic leaves in the fall - the colours stunning and the slow transition lasts for weeks. The picturesque city-scape is very popular with its mixture of orange, yellow and red colours. The city is known for its heritage trees and the urban forest includes ash, maple, oak, chestnut, cedar, fir and elm tree species. Whether you are walking the streets of Kaslo (Highway 31) or along the Kaslo River Trail, they all lead you to rich forests and vibrant colours. September to mid-October are the best times to visit for the fall colours. It is also a time with less crowds and more space to enjoy the cafes, shopping and heritage sites. A drive north from Kaslo along Kootenay Lake to Meadow Creek leads you to a pristine landscape that is blanketed with trees and stunning fall colours. Pack a lunch and walk high into the mountains at Davis Creek or Monica Meadows for views you will remember and cherish forever. There are several streets in the village of Nakusp that have spectacular colours: Broadway into 10th Avenue and 2nd & 5th Avenue NW, there's a grand showcase of maple trees. The Waterfront Walkway features a great display of mostly oak trees. In the nearby village of Fauquier, there are oaks planted down the boulevard that are viewable from the highway. Enjoy a beautiful fall walk in downtown Revelstoke along Mackenzie Avenue towards the Greenbelt River Trails. You'll find the brilliant red of the well-spaced maple trees provide a beautiful contrast against the mountains, sky and bridge in the distance. Fernie Golf & Country Club, Matt Glastonbury photo. The Larch needles are beginning to turn yellow. Broadway Street into 10th Avenue (west of 7th Ave) - Nakusp. The city of Nelson, alonside Kootenay Lake. The maple leaves turn a beautiful dark red shade in the fall. By Claire Paradis; 5th Avenue NW.